Sremska Mitrovica (Serbian Cyrillic: Сремска Митровица, pronounced [srêːmskaː mîtroʋitsa]) is a city and the administrative center of the Srem District in the autonomous province of Vojvodina, Serbia. It is situated on the left bank of the Sava river. As of 2011[update], the city has a total population of 37,751 inhabitants, while the city administrative area has a population of 79,940 inhabitants. Once a capital of the Roman Empire during the Tetrarchy, the city was referred to as the glorious mother of cities. Likewise, ten Roman emperors were born in or near this city, Emperors Herennius Etruscus (251), Hostilian (251), Decius Traian (249–251), Claudius Gothicus (268–270), Quintillus (270), Aurelian (270–275), Probus (276–282), Maximian (285–310), Constantius II (337–361) and Gratian (367–383). In Serbian, the town is known as Сремска Митровица or Sremska Mitrovica, in Rusyn as Сримска Митровица, in Croatian as Srijemska Mitrovica, in Hungarian as Szávaszentdemeter or Mitrovica, in German as Syrmisch Mitrowitz, in Latin as Sirmium, and in Turkish as Dimitrofça. "Sremska Mitrovica" means "Mitrovica of Syrmia" (Mitrovica, Kosovo and Mačvanska Mitrovica also exist), while "Mitrovica" itself stems from the name "Saint Demetrius" or "Sveti Dimitrije" in the Serbian language (in Cyrillic form "Свети Димитрије"). The name of the city during the reign of the Roman Empire was Sirmium. Beginning in 1180 AD the name changed from "Civitas Sancti Demetrii" to "Dmitrovica", "Mitrovica", and finally to the present form - "Sremska Mitrovica". Sremska Mitrovica is one of the oldest cities in Europe. Archaeologists have found a trace of organized human life dating from 5000 BC onwards. Ionian jewellery dating to 500BC was excavated in the city. When the Romans conquered the city in the 1st century BC, Sirmium already was a settlement with a long tradition. In the 1st century, Sirmium gained a status of a colony of the citizens of Rome, and became a very important military and strategic location in Pannonia province. The war expeditions of Roman emperors Traian, Marcus Aurelius, and Claudius II, were prepared in Sirmium. In 103, Pannonia was split into two provinces: Pannonia Superior and Pannonia Inferior, and Sirmium became the capital city of the latter. In 296, Diocletian implemented a new territorial division of Pannonia. Instead of previous two provinces, there were four new provinces established in former territory of original Pannonia: Pannonia Prima, Pannonia Valeria, Pannonia Savia and Pannonia Secunda. Capital city of Pannonia Secunda was Sirmium. In 293, with the establishment of tetrarchy, the Roman Empire was split into four parts; Sirmium became one of the four capital cities of the Empire, the other three being Augusta Treverorum, Mediolanum, and Nicomedia (modern Trier, Milan and Izmit). During the tetrarchy, Sirmium was the capital of emperor Galerius. With the establishment of praetorian prefectures in 318, the capital of the prefecture of Illyricum was Sirmium. Beginning in the 4th century, the city was an important Christian centre, and was a seat of the Episcopate of Sirmium. Four Christian councils were held in Sirmium. At the end of the 4th century, Sirmium was brought under the sway of the Goths, and later, was again annexed to the Eastern Roman Empire. In 441, Sirmium was conquered by the Huns, and after this conquest, it remained for more than a century in the hands of various Germanic tribes, such were Eastern Goths and Gepids. For a short time, Sirmium was the center of the Gepide State and the king Cunimund minted golden coins in it. After 567, Sirmium was again incorporated into Eastern Roman Empire. The city was conquered and destroyed by Avars in 582. This event marked the end of the period of late Antiquity in the history of Sirmium. 11 luxurious golden belts of Avar handicraft dating to the 6th century was excavated in the vicinity. For the next two centuries Sirmium was a place of little importance. At the end of the 8th century, Sirmium belonged to the Frankish State. The historical role of Sirmium increased again in the 9th century, when it was part of the Bulgarian Empire. Pope Adrian II gave St Methodius the title of Archbishop of Sirmium. After having adopted Christianity, the Bulgarians restored in Sirmium the Christian Episcopate, having in mind old Christian traditions and the reputation this city had in the ancient world. In the 11th century, Sirmium was a residence of Sermon, a duke of Syrmia, who was a vassal of the Bulgarian Samuil. After 1018, the city was again included into the Byzantine Empire, and since the end of the 11th century, Sirmium was a subject of a dispute between the Byzantine Empire and the Kingdom of Hungary, until 1180 when the Byzantine Empire gave up Sirmium, surrendering it to the Kingdom of Hungary. In the 11th century, a Byzantine province named Theme of Sirmium had its capital in this city. For a while, about 1451, the city was in possession of the Serbian despot Đurađ Branković. In 1521 the city came into Ottoman hands and it remained under the Ottoman rule for almost two centuries. According to Ottoman traveler Evliya Celebi, Mitrovica had been conquered by the Bosnian sanjak bey Husrev-bey. She was renamed as "Dimitrofça". The name of the mayor of the city was Dimitar and since the middle of the 16th century, the city was mostly populated with Muslims. According to the 1566/69 data, the population of the city was composed of 592 Muslim and 30 Christian houses, while according to the 1572 data, it was composed of 598 Muslim and 18 Christian houses. According to the 1573 data, the city had 17 mosques and no Christian church. During the Ottoman rule, Sremska Mitrovica was the largest settlement in Syrmia, and was the administrative center of the Ottoman Sanjak of Syrmia. It was temporarily occupied by Austrian troops between 1688 and 1690. They finally took it in 1717 and took possession of it after signing Treaty of Passarowitz in 1718. With the establishment of the Habsburg administration in 1718, the Muslim population fled from the city and was replaced with Serbian, Croatian, and German settlers. According to the 1765 data, the population of the city numbered 809 people, of whom 514 were Serbs and 290 Catholics. Sremska Mitrovica was part of the Habsburg Military Frontier (Slavonian Krajina). In 1848-49, it was part of the Serbian Voivodship, a Serb autonomous region within Austrian Empire, but in 1849, it was returned under administration of the Military Frontier. With the abolition of the Slavonian Military Frontier in 1881, Sremska Mitrovica was included into Syrmia County, which was part of the Kingdom of Croatia-Slavonia within Austria-Hungary. According to the 1910 census, the population of the city numbered 12,909 people, of which 8,793 spoke the Serbo-Croatian language (4,878 of those spoke Serbian and 3,915 spoke Croatian) and 2,341 German. The administrative area of the city (which did not included the city itself) had 32,012 inhabitants, of which 28,093 spoke Serbo-Croatian (27,022 of those spoke Serbian and 1,071 spoke Croatian) and 2,324 German. In 1918, the Austro-Hungarian Monarchy collapsed and the Syrmia region first became a part of the newly formed State of Slovenes, Croats and Serbs, and then, on 24 November 1918, the assembly of Syrmia in Ruma decided that most of Syrmia (including Mitrovica) join to the Kingdom of Serbia. Subsequently, on 1 December 1918, Kingdom of Serbia united with the Kingdom of Montenegro and the State of Slovenes, Croats and Serbs to form the Kingdom of Serbs, Croats and Slovenes (renamed to Yugoslavia in 1929). Between 1918-22, Sremska Mitrovica was part of the Syrmia County, between 1922-29 part of the Syrmia Oblast, between 1929-31 part of the Drina Banovina, and, between 1931-41, part of the Danube Banovina. During World War II, the city was occupied by Axis troops and was attached to the Independent State of Croatia. During that time its name was changed to Hrvatska Mitrovica (meaning Croatian Mitrovica). One of the largest Nazi concentration/death camps in the Independent State of Croatia existed in Sremska Mitrovica and as many as 10,000 victims (Serbs, Jews, and antifascists) were killed here. The Serbian Jewish population was to be interned in a concentration camp built first in Jarak and then at Zasavica. However, both locations proved to be too flooded for construction. The Germans had to abandon these locations and use Sajmište, which resulted in the destruction of 83% of Serbian Jewry. Beginning in 1944, the town was part of the Autonomous Province of Vojvodina within the new Socialist Yugoslavia and, from 1945, within the Socialist Republic of Serbia. From 1992 to 2003 it was part of the Federal Republic of Yugoslavia, which was then transformed into the state union of Serbia and Montenegro. Since the 2006 independence of Montenegro, Sremska Mitrovica is part of an independent Serbia. According to the 2011 census results, the city administrative area has a population of 79,940 inhabitants. Most of the settlements in the city have an ethnic Serb majority. Ethnically mixed settlement with relative Serb majority is Stara Bingula. The main concentration of ethnic minorities is in the urban area of the city. In 2002, the population of city of Sremska Mitrovica included 76,290 Orthodox Christians, 3,935 Roman Catholics, 252 Protestants and 106 Muslims. Orthodox Christians in Sremska Mitrovica are belonging to the Eparchy of Syrmia of the Serbian Orthodox Church. Catholics belong to the Diocese of Syrmia, which has its seat in Sremska Mitrovica. During work on the new Sremska Mitrovica trade center in 1972, a worker accidentally broke into an old Roman pot, about 2m deep, over the site of an old Sirmium settlement. 33 gold Roman coins enclosed in a leather pouch were found inside a Roman house wall, probably the hidden savings of a wealthy Roman family stashed centuries ago. Of this extraordinary rare find of Sirmium minted coins were four Constantius II era coins, considered the most valuable examples from the late Roman empire of the 4th century AD. The young worker whose shovel brought this significant discovery to light was never rewarded. The only known unexcavated Roman horse racing arena in the world is in Sirmium. A colossal building about 150m wide and 450m long lays directly under the Sremska Mitrovica town center and just beside the old Sirmium Emperor's Palace (one of just a few Sirmium publicly accessible archeological sights). The presence of the arena has clearly affected the layout of the present town (Sremska Mitrovica is today about 2-4m above ground line of the former Sirmium settlement). Sremska Mitrovica has a humid continental climate (Köppen climate classification: Dfb). KAF Sirmium Legionaries, an American Football club from Sremska Mitrovica. This is the first club of American Football in Serbia. FK Srem, a football club from Sremska Mitrovica. KK Val, a canoe club from Sremska Mitrovica. The last emperor of the united Roman Empire, Theodosius I (378–95), became emperor in Sirmium. The usurpers Ingenuus and Regalianus also declared themselves emperors in this city (in 260) and many other Roman emperors spent some time in Sirmium including Marcus Aurelius who might have written parts of his famous work Meditations in the city. 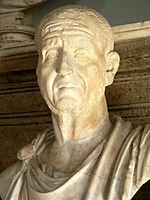 Maximinus, Roman emperor (235-238), ruled from residence in Sirmium. Herennius Etruscus, Roman emperor (251), born in Sirmium. Decius Traian, Roman emperor (249-251), born in village Budalia near Sirmium. Ingenuus, Roman emperor (260), proclaimed himself emperor in Sirmium. Regalianus, Roman emperor (260), proclaimed himself emperor in Sirmium. Claudius II, Roman emperor (268-270), born in Sirmium and spent most of his life there. Aurelian, Roman emperor (270-275), born in Sirmium. Probus, Roman emperor (276-282), born in Sirmium. Maximianus Herculius, Roman emperor (285-310), born near Sirmium. Galerius, Roman emperor (305-311), ruled as Caesar during the Tetrarchy from residence in Sirmium (293-296). Crispus, a Caesar of the Roman Empire. He was proclaimed Caesar in Sirmium in 317. Constantine II, a Caesar of the Roman Empire. He was proclaimed Caesar in Sirmium in 317. Vetranion, Roman emperor. Proclaimed himself emperor in Sirmium (in 350). Constantius II, Roman emperor (337-361), born in Sirmium. Gratian, Roman emperor (367-383), born in Sirmium. Theodosius I the Great, Roman emperor (378-395). He became emperor in Sirmium. Valerius Licinius, prefect of the Diocese of Pannonia with residence in Sirmium (308-314). Apricanus, prefect of the Pannonia Secunda province with residence in Sirmium (355). Mesala, prefect of the Pannonia Secunda province (373). Petronius Prob, prefect in Sirmium (374). Aurelius Victor, prefect of the Pannonia Secunda province, wrote a History of Rome under the emperor Julian. Leontius, prefect in Sirmium (426). Apraemis, prefect of the Prefecture of Illyricum with residence in Sirmium (before 441). Thraustila, king of the Gepids with residence in Sirmium (473). Cunimund, king of the Gepids with residence in Sirmium. Sermon, duke of Syrmia (11th century). ^ "2011 Census of Population, Households and Dwellings in the Republic of Serbia: Comparative Overview of the Number of Population in 1948, 1953, 1961, 1971, 1981, 1991, 2002 and 2011, Data by settlements" (PDF). Statistical Office of Republic Of Serbia, Belgrade. 2014. p. 45. ISBN 978-86-6161-109-4. Retrieved 2014-06-27. ^ "The Contested Country". google.com. ^ "Serbian Studies". google.com. Retrieved 30 July 2018. ^ "2011 Census of Population, Households and Dwellings in the Republic of Serbia" (PDF). stat.gov.rs. Statistical Office of the Republic of Serbia. Retrieved 4 March 2017. ^ "Попис становништва, домаћинстава и станова 2011. у Републици Србији" (PDF). stat.gov.rs. Republički zavod za statistiku. Retrieved 4 March 2017. ^ "Monthly and annual means, maximum and minimum values of meteorological elements for the period 1981-2010" (in Serbian). Republic Hydrometeorological Service of Serbia. Retrieved 17 March 2017. ^ "ОПШТИНЕ И РЕГИОНИ У РЕПУБЛИЦИ СРБИЈИ, 2018" (PDF). stat.gov.rs (in Serbian). Statistical Office of the Republic of Serbia. Retrieved 17 March 2019. ^ Градови партнери [City of Banja Luka - Partner cities]. Administrative Office of the City of Banja Luka (in Serbian). Archived from the original on 17 September 2011. Retrieved 9 August 2013. Wikivoyage has a travel guide for Sremska Mitrovica. Wikimedia Commons has media related to Sremska Mitrovica.